Pfizer’s Xeljanz and Xeljanz XR treat rheumatoid arthritis, psoriatic arthritis and ulcerative colitis. The drug works by decreasing the activity of the immune system. In February 2019, the U.S. Food and Drug Administration released a safety communication to alert the public that a clinical trial found an increased risk of blood clots in the lungs and death when people took high doses of the drug to treat rheumatoid arthritis. Xeljanz is an oral prescription medication approved to treat moderately to severely active rheumatoid arthritis, psoriatic arthritis and ulcerative colitis. It also comes in an extended release formula, Xeljanz XR. Both formulas contain the active ingredient tofacitinib. The medication belongs to a class of drugs known as Janus kinase inhibitors or JAK inhibitors. Pfizer first gained U.S. Food and Drug Administration approval to sell Xeljanz in the United States in 2012. Since its release, the drug has become a blockbuster for Pfizer. In 2018, it brought in about $1.8 billion worldwide. More than 80 countries approved the medication for treatment of rheumatoid arthritis (RA). In addition, over 40 countries approved it for the treatment of active psoriatic arthritis (PsA), and 70 countries approved it for the treatment of ulcerative colitis (UC). More than 80 countries have approved Xeljanz to treat rheumatoid arthritis. From January 2013 to July 2018, doctors prescribed the drug to about 132,000 people to treat their rheumatoid arthritis, according to the Xeljanz website. How Is Xeljanz Different From Xeljanz XR? Despite its popularity, the drug may cause a number of side effects. The side effects reported most often during the first three months of rheumatoid arthritis clinical trials were upper respiratory tract infection, cold-like symptoms, diarrhea, headache and hypertension. People who participated in UC clinical trials also reported rashes, gastroenteritis and elevated cholesterol levels. The drug carries the FDA’s most serious warning, a black box warning, for an increased risk of serious infections and reports of malignancies such as lymphoma. 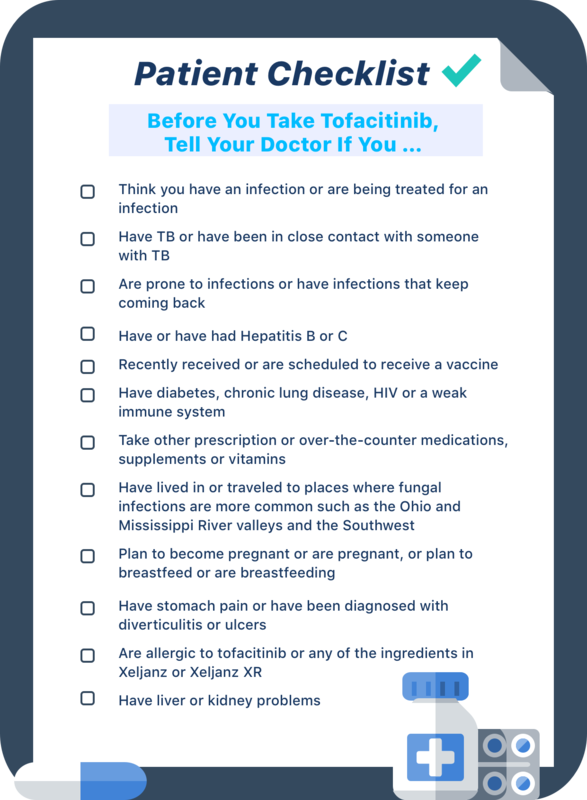 Most recently, the FDA released a warning in February 2019 about a safety clinical trial that found people who used higher doses of tofacitinib to treat RA had a higher risk of blood clots and death. Lawyers are currently investigating these cases and filing lawsuits on behalf of patients. Xeljanz works by inhibiting production of cytokines, which are proteins that help control immune system responses. When our bodies fight infections, cytokine production increases. People with RA overproduce cytokines, and this leads to inflammation and pain. Xeljanz disrupts cell signals in the Janus kinase (JKA) pathways to reduce the production of cytokines, according to a video on the Xeljanz website. In people with psoriatic arthritis and ulcerative colitis, the drug works the same way to lower inflammatory responses that cause symptoms. Depending on the reason doctors prescribe the drug, it may have different dosage instructions. Patients can take the medicine with or without food. People may take Xeljanz or Xeljanz XR with or without a nonbiologic disease-modifying antirheumatic drug (DMARD) such as methotrexate. But they should not use it with biologic DMARDs or potent immunosuppressants such as azathioprine and cyclosporine. Patients with severe liver impairment should not use these drugs. Do not take Xeljanz XR for ulcerative colitis. Xeljanz 5 mg twice daily or Xeljanz XR 11 mg once daily; the recommended dosage for people with severe renal impairment or moderate hepatic impairment is Xeljanz 5 mg once daily. Xeljanz 5 mg twice daily or Xeljanz XR 11 mg once daily; the recommended dosage in patients with moderate and severe renal impairment or moderate hepatic impairment is XELJANZ 5 mg once daily. Xeljanz 10 mg twice daily for at least eight weeks; then 5 mg or 10 mg twice daily. Patients should talk to their doctor about stopping the drug if they’ve taken 10 mg twice daily for 16 weeks and they’re not getting the benefits they thought they would. Patients should use the lowest effective dose to maintain the benefits. People with moderate and severe renal impairment or moderate hepatic impairment should use half the dose recommended for people with normal liver and kidney function. Pfizer studied the effectiveness of Xeljanz in patients who took the drug alone or with another DMARD such as methotrexate. The company conducted six studies of more than 4,200 patients with moderate to severe RA. In clinical studies, medication reduced RA joint pain in as little as two weeks. Though for some patients, the drug may take three to six months to work, according to the Xeljanz website. In clinical studies, Xeljanz reduced rheumatoid arthritis joint pain in as little as two weeks. In the ORAL Solo Study of patients who took Xeljanz without methotrexate, 30 percent of tofacitinib patients (71 out of 240) experienced a 20 percent reduction in tender and swollen joints after two weeks. In comparison, 12 percent (14 out of 119) patients in the placebo group experienced the same result. For UC, the drug can improve the appearance of the intestinal lining and reduce rectal bleeding and stool frequency in as little as two weeks, according to Pfizer. Combining tofacitinib with other medicines that treat rheumatoid arthritis, psoriatic arthritis or ulcerative colitis may increase the risk of infection. The drug’s label recommends against taking the medicine in combination with biologic DMARDs or potent immunosuppresants. People who plan to take Xeljanz should tell their doctors about all the supplements, vitamins and drugs they take. On Feb. 25, 2019, the FDA released a Safety Communication about an increased risk for blood clots in the lungs, known as pulmonary embolisms, and death in patients who took Xeljanz during a safety trial. When the FDA approved the drug, it required Pfizer to conduct a clinical trial to evaluate the risk of heart-related events, cancer and opportunistic infections in rheumatoid arthritis patients who take the drug in combination with methotrexate. The trial was designed to evaluate the treatment at two doses and compare the risks to another drug called a tumor necrosis factor, or TNF, inhibitor. Drugs in the TNF inhibitor class include Humira, Remicade and Enbrel. A safety monitoring committee found the increased risk after it reviewed the results from the ongoing study. The increased risk occurred specifically in people with rheumatoid arthritis who took 10 mg of the drug twice daily. The FDA has not approved this dose for people with RA but has approved it in patients with UC. In a long-term UC extension study, four people had pulmonary embolisms and one patient with advanced cancer died, according to a Dear Healthcare Provider letter.